Among the children playing in the water on the Autism Speaks Southern New Jersey Walk summary page are my son Jordan (denim shorts) and cousin Avana (yellow shorts). We were among 3,500 people that participated and helped raise $263,000 for Autism. It was a hot day and the Mount Laurel Fire Dept made it so much fun for the kids (and adults) to cool down. The next walk is in October. The weather should be cooler but we expect to have just as much fun! But things are always less scary when the lights are on -- so throughout the campaign HuffPost will be conducting a FearWatch, keeping our eyes peeled for the lowest, most base attempts to scare voters into voting their fears, and collecting them on a FearWatch08 page. Hopefully, this will keep the truth in the light and people will be more apt to vote their hearts and not their fears. We really can't have another four years of a Bush regime. The country just can't afford it anymore. Is the Bush regime on its last legs? Read Robert Novak's Op Ed piece here and you decide. Please keep the victims of the flooding along the Mississippi River in your hearts and prayers. All pictures came from Yahoo! News photo gallery. After Senator Obama won the Democratic nomination, he and his wife gave each other a "pound" in front of the cameras—a Fox anchor called it a "terrorist fist jab." Then last week, a Fox News on-screen graphic referred to Michelle Obama as "Obama's baby mama"—an attempt to associate the Obamas with racist stereotypes. ColorOfChange.org would like for all of us to click here and tell Fox News chief Roger Ailes to stop racism before it hits the airwaves, and make it clear that you'll take action when another racist smear happens. Read the detailed e-mail message that ColorOfChange.org originally sent to members about this petition. 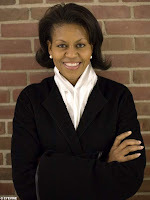 The New York Times has a great article today called "Michelle Obama Looks for a New Introduction." Not that she needs one. But for some reason, people are so ready to think the worst of her. Is it because she is bright and intelligent? Because she would be one of two first ladies that graduated from law school? Or is it merely because so many political pundits and critics are looking for a way to bring her down because she's Black? This article, along with the Obama's website Fight The Smears, does a great job of letting you know who Michelle really is. I hope that people take the time to read it and to get to know her. After all, she may be in the limelight for a long time to come. My uncles should have the answer! Yesterday my uncle Freddy caught a striped bass that weighed over 30 lbs. My uncle Teddy managed to pull in a 46 pounder. The ship's captain said that other crew members pulled in several 30 and 40 pounders as well as two that topped 50 lbs. "Most giant bass I’ve seen in one day in my life!" he said. Check out my uncles here and click on the title or this link to the page to see the rest! Jordan and the members of Pack 10, Den 10 that plan to continue scouting next year advanced to their next level and received achievement awards in a ceremony held on June 6. The boys went into the Cub-O-Matic as Wolves (gold) and came out on the other side as Bears (light blue). The pack then held a carnival celebration which included a fire truck, a dunk tank, pony rides, cotton candy, popcorn and even a visit from Mr. Softee. Congratulations to Jordan and all of the Burlington Twp. boys that transitioned this year. Happy Father's Day to my husband Darryl King, my awesome Dad, James Barbour Jr., my grandfather Harold Barbour, my Godfather Roger West and my brother, who is my children's Godfather, Jim Barbour III. Thank you so much for all that you do! I love you! The Obama campaign is tired of fighting with right-wing Fox News anchors and Rush Limbaugh and quite frankly, anyone who has started or continued spreading hateful, unfair, and untrue rumors about him and his family. To combat this ongoing issue, they have set up a new web page called Fight The Smears. This page is dedicated to revealing the truths behind all of the rumors created to cause non-issue related problems with the democratic campaign. It us our hope and theirs that people will come here to learn the truth about this phenomenal presidential candidate rather than spread and believe things that they've heard on the Internet or on TV. I hope that people use this resource to it's full potential so that they get to know the man who will spearhead this Generation of Change. "...what I really hope people take away from that night is that this is not just a victory for African Americans, it is a victory for democracy that proves that our country provides possibilities for all people. It is also a sign that a metamorphosis is in progress." These were the touching words made by Bishop TD Jakes yesterday regarding Barack Obama's victory of the Democratic Nomination. Because no matter what the outcome is in November, in a way, Black Americans have already won. An Obama victory in the next leg of this battle would be icing on a richly deserved cake. As one CNN analyst said the other day, "we are only one generation from the Civil Rights movement." What a powerful idea. Martin Luther King, Jr. died one month before I was born. My parents were thick within the movement era. They are among a large group of people who are still young and vibrant and active enough to have a say in this election and to REALLY know what it means. I am in Obama's generation. I have never had to struggle for freedom, although I have found that, growing up as a Black child in a predominantly white community, my life has been a struggle for acceptance. What I have grown to realize is that the only one that had to accept me was ME. After that, everything else just fell into place. And like Bishop Jakes states in his commentary, I also sat with my children during Obama's victory speech. Because nothing that McCain or Clinton could say (or NOT say) could take this amazingly historic moment away from us. I will always remember. My children will always remember. Theirs is no longer a generation built on the painful memories of 9/11. Now, my children are officially members of The Generation of Change!